Warwick Mayor Scott Avedisian presents a formal proclamation of congratulations yesterday to Gladys Aldrich, during her 100th birthday party in the city’s Buttonwoods Community Center. WARWICK — Yesterday was a lucky day for Gladys Aldrich. 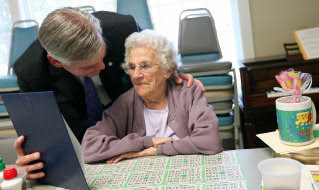 She was only part way through her afternoon of bingo at the city’s Buttonwoods Community Center and she had already snagged $10 in winnings. Her streak was interrupted, however, by a surprise visit from the mayor and a giant sheet cake adorned with pink flowers. Gladys Aldrich turned 100 yesterday to the applause and cheers of the friends and staff members who know her as a regular at the center’s weekday bingo games. Surprised and tickled by the attention, Aldrich said her secrets to longevity include not drinking water, not taking medication and playing as much bingo as she can. She said that although she is a widow, she is quite happy socializing with her friends and is most definitely not looking for a beau. Outspoken, quick and not shy, Aldrich said she appreciated the citation from the mayor but reminded him that the last time she saw him she was “telling him off” for removing the hot lunch program there. Good friends Doris Roper, 82, and Jean Benson, 81, said they enjoy socializing with Aldrich. Roper confided that their friend enjoys frequent visits to Foxwoods for even more bingo. Although a family party is planned this weekend, Benson said she made sure that the staff at the community center knew about Aldrich’s birthday so the day would not go without ceremony. Aldrich caused more than a few people to blush when she was pressed for details about the lifestyle that led her to celebrate her first century.